How are you on the glorious Saturday? I’m going to get right down to it! I have some good news and some bad news. First the good news, I made this. The bad news is, I finished this. Sorry! Sorry, I ate your Cookie Butter, so I guess the winner of my giveaway is me! Ha ha!!! Just kidding, I would never do that to you!! Lucky for me I have back up Cookie Butter!! I could never just have one jar on hand and I would never take your jar, unless you said I could. 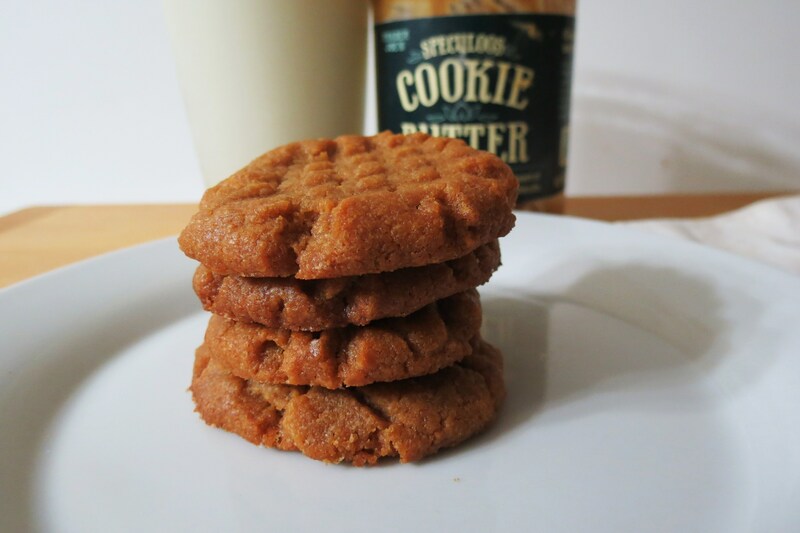 When I was coming up for a recipe to use the Speculoos Cookie Butter, I wanted to create something that has a full blown Cookie Butter flavor. I originally thought of making cupcakes or little ball cookies, or a dip, but I really just wanted a traditional cookie. So I decided on making Flourless Cookies that do not require a lot of work or ingredients and had to contain a big, fat cup of Cookie Butter! Yum! Than the perfect cookie was born! They are crispy and chewy! I love that in a cookie!! 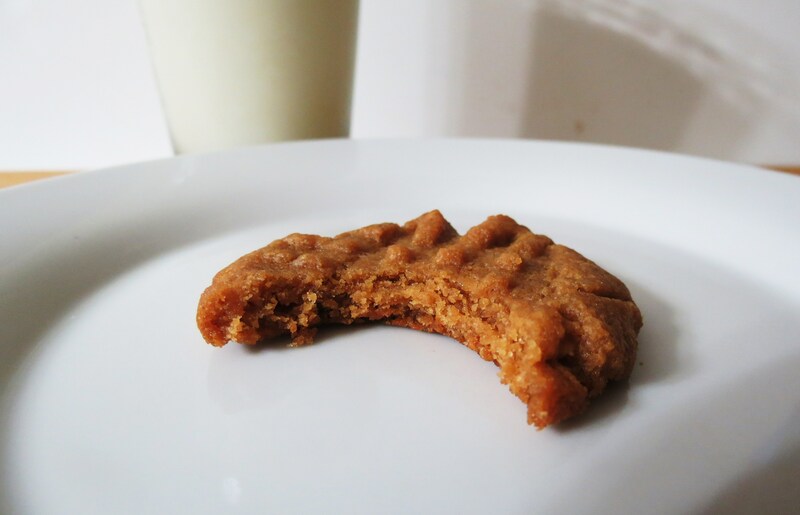 The flavor of the Speculoos is amazing! You get a lot of flavor in this cookie. 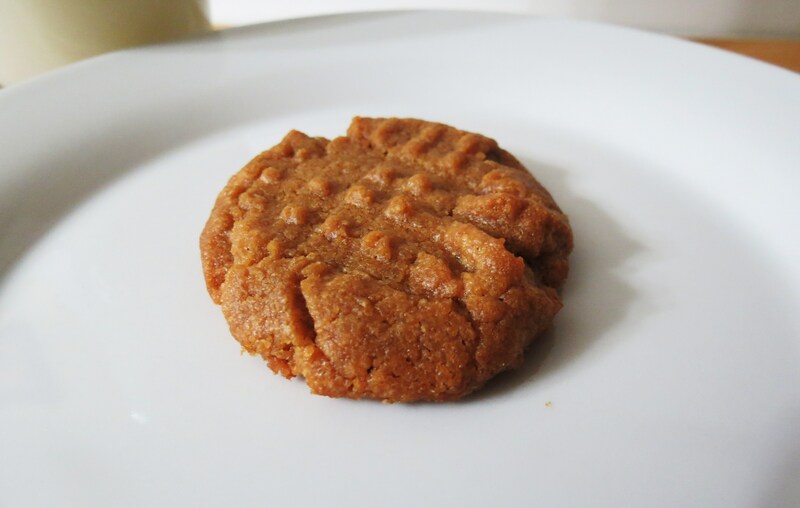 If you like the Speculoos Cookie flavor than this cookie is for you!! 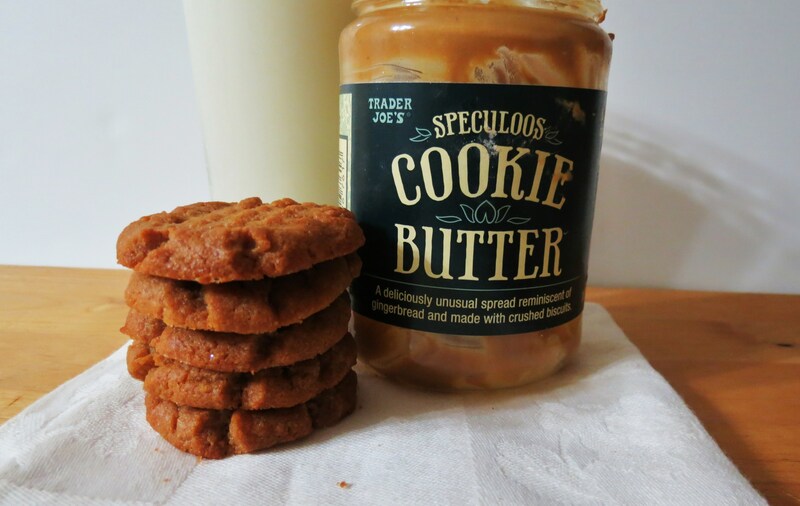 If you can’t get Speculoos Cookie Butter or maybe, I don’t know how, but maybe you don’t like the flavor, than you could sub peanut butter for the Cookie Butter. I plan on making this same recipe using one of my homemade nut butters. I bet it will be good!! I told my Husband that I made cookies and to try one. He looked at them and said oh there peanut butter, you know in that disappointed tone. First thought than ran through my head is, what’s wrong with peanut butter? I think he is just jealous because he knows I have a secret love for peanut butter. But I told him, uh uh, just try one. He did, and then he ate another. Than he asked, “Can I take these to work with me tomorrow?” I guess the man likes Speculoos Cookie Butter. Hmmm, I’m surprised. So I packed up a bag for him to take to work! Than I froze the other bag. I can’t let him take all of my goodies!! Hope he doesn’t find the other bag. In a medium bowl, using a spoon, mix all ingredients until just blended. Take about a tablespoon of dough and roll into ball, place onto a parchment lined baking sheet and press a crisscross pattern into each drop with a fork. Bake 10 to 15 minutes, or until light golden. Cool before removing from baking sheet. I wanted to thank Erin from Big Fat Baker! 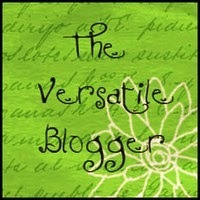 She gave me the Versatile Blogger Award! he he I am so honored!!! My duties for this award is to tell you 7 things about myself and to pass the award on to 15 other new or newly discovered bloggers. 1. I always cut my meat before I eat it! People think it’s strange. 2. 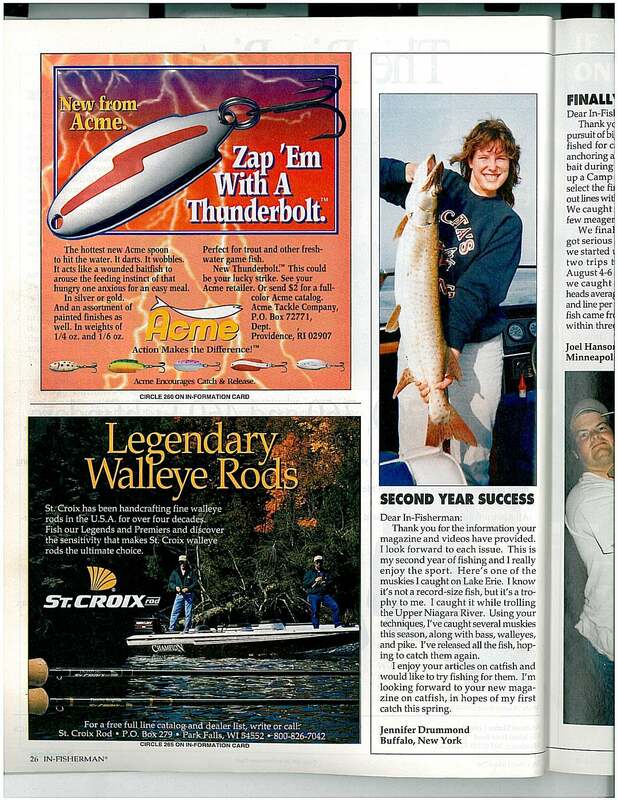 I have gone fishing and caught a 4.5′ Muskie and had my picture in InFisherman Magazine. 3. I was always a cat person, until my boyfriend (Husband now) begged for me to get a dog. I don’t know how I have gone through my life without having dogs. There my babies! 4. I used to be a shuttle driver for an Oldsmobile Dealership. It was my first full-time job and I worked there for years. 7. I used to hate Peanut Butter until I went to Whole Foods and got some fresh PB from their machine! Now I am addicted and can’t believe I have gone so long without it!! I honestly thought it would be hard to find 15 blogs, but when I went through all the ones I love, I had about 50 or more! It was hard for me to narrow it down. I think everyone deserves an award and I also think everyone’s blogs are wonderful. I love them because they show everyone’s individuality. Thank you Big Fat Baker for giving this to me!! I saw a few on your list that I would have chosen too, but I wanted to get the award out to some newbies too!! Now don’t forget to enter my Trader Joe’s giveaway!! I will be picking a winner on Sunday afternoon, so the goodies can ship out first thing Monday!!! these look really yummy. I am planning a trip to TJ’s soon so hopefully I will be able to keep my head together in to the store to stay focused on all the yumminess! Congratulations on the award and these cookies sounds fabulous! I cannot believe the perfect shape they have with no flour! Those look SO chewy and delicious! You have to try the Cookie Butter! Now I’m still a PB fan, but my Hubby loves the Cookie Butter! He ate just about the whole batch of them in two days! Thank you Jennifer, you are so sweet ……. and so are these cookies, YUM! I love speculoos! You’re welcome 🙂 I had a hard time picking too, there are so many people I admire in the food blog world. These sound awesome. I was just looking at that cookie butter when I was at Trader Joe’s the other day. I wasn’t quite sure what it was all about. After reading this post, I could kick myself for not buying a jar. The Cookie Butter seems to be all the rage! I have seen so many blogs about it! Thanks Liz! Congrats to you to! I saw that Big Fat baker picked you! You deserve it! I love your blog and all of your recipes!! I subscribe to your blog via email and my absolute favorite Trader Joe’s product is their Carrot Ginger Oat Muffins. Sooo yummy! mmm… so simple! What even is cookie butter? We don’t have Trader Joe’s yet 🙁 But maybe I could have some shipped! I’m so intrigued. Thank you for including me! Hope you had a great weekend!! I have been trying to find more gluten-free or flourless recipes for my son. I was hoping to make these cookies for him – he would LOVE them! But it looks like the Speculoos cookie butter has wheat in it – the 1st ingredient? 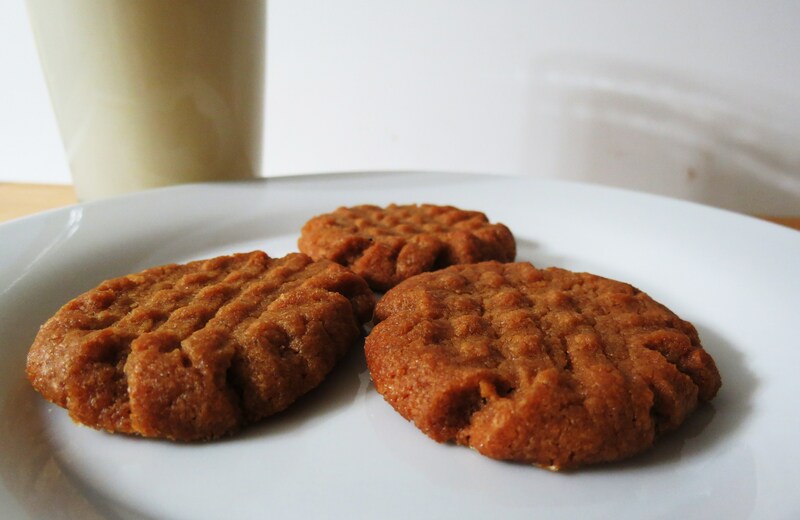 Do you know of a gluten-free version of the speculoos? These sound very tasty! 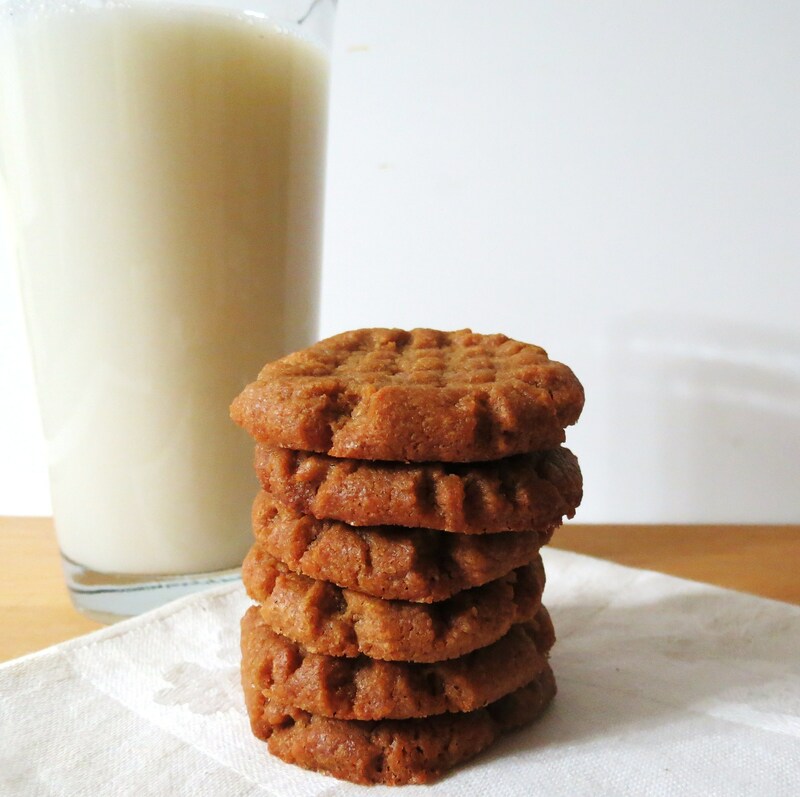 You can make these cookies, just use your favorite peanut butter!! Thats what I plan on doing next. Hmmm, I never looked at the ingredients, when I pick up another jar, I’ll have to look. Haha, I love that you made ground up cookies back into cookies 🙂 Speculoos (Spekulatius in German) are Christmas for me. Yours look delicious! I’ve not yet found GF Speculoos anywhere! And the TJ brand is NOT gluten free 🙁 But have you tried their GF crispy chocolate cookies yet? They are great! Thank you so much Jennifer, you are always so sweet and supportive!! I will post it on my blog when I can narrow down the list of deserving bloggers to 15…there are so many amazing ones out there!! You deserve it! I love your blog!! You guys are funny and your meals and treats look out of this world!! Thanks for the recipe!!! Last time I looked for cookie butter my store was out. These cookies have my stomach growling. I think I’m going to go check to see if they have restocked my store tomorrow. I can’t wait to explore the rest of your blog! I just made these and to my dismay they were not very good at all. I followed the recipe and even double checked it to make sure I didn’t leave anything out. My cookies came out extremely flat and crumbly. 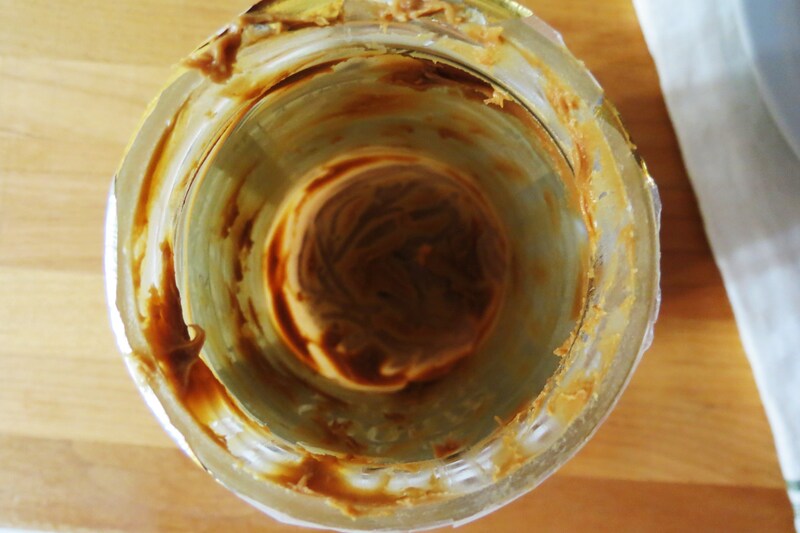 I mean they were like paper thin… and to be honest I wasn’t even a huge fan of the taste, despite the fact that I’m in love with cookie butter itself. Hi Joscelyn, I understand about the cookies. 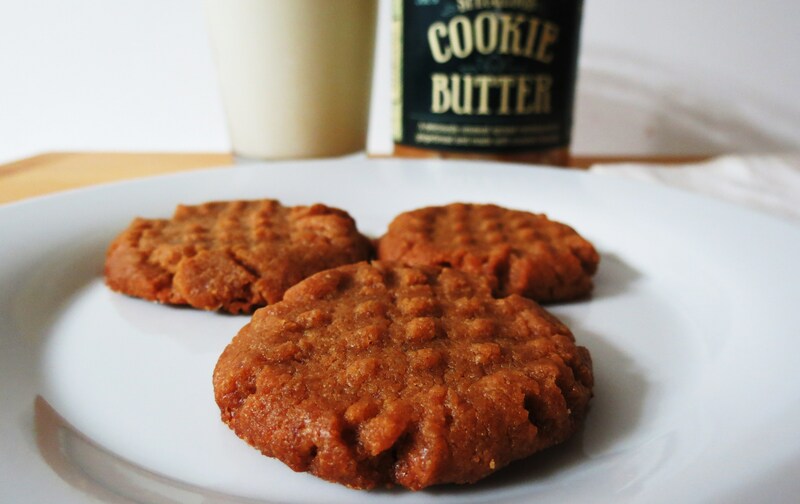 When I made these, I used the Cookie Butter when it first came out, back in 2011. Than I made it again, when the Cookie Butter was back in stock, and they turned out flat like yours. I gave them to my Husband to take to work and his co-workers liked them,but I didn’t. I’m very disappointed in the cookies to and I am going to take the cookies off my blog. I really don’t understand what happened to them? This is the exact recipe I used before and they turned out great, did it again and they turned out flat. I’m so sorry for this! !